I finally heard back from SA TAF about the trim tab hinge pin. They said go ahead with the planned install of the rivnut. So finally I could finish up the elevator. I installed the clevis to the trim servo and got it close to center. This will be adjusted later so I just put some heat shrink on the cotter pin so it doesn’t fall out and to remind me this needs to be finished. I also attached the elevator to the HS mainly to make sure everything looked good and lined up. I’ll probably leave it like this and find a place to store it as a whole assembly. Installed the M3 rivnut and secured the hinge pin using the part I made from the end of a hinge section and an M3 screw with some medium thread lock. It holds the pin really well and the trim tab moves nice and free. I did try to install the clip on the inside of the bend, but I noticed that the pin did have a tendency to try to slip out a bit. This is because the clip and the pin were both in the same rotational plan. With the clip on the other side of the bend the pin doesn’t try to slip out of it because the rotate against each other. 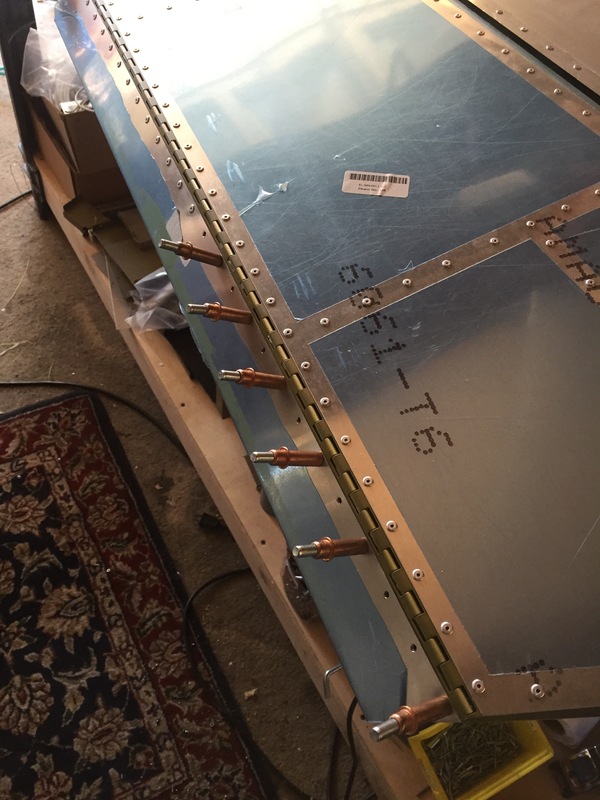 Clevis is installed on the trim tab side. This will need to be fine tuned later so I didn’t bend the cotter pin. I just put a long, obvious piece of heatshrimk on it so it doesn’t fall out and get lost. Loosely put in the AN4-5 bolts and washers on the elevator/HS hinges. The washers were a pain to get in especially the second one on the inside. I ended up using some masking tape to slip the washer in and hold it then pulled it out once the bolt captured the washer. After some practice it wasn’t too difficult to get a hinge done. I also made sure to point bolts inwards. I installed a short 3.2mm rivet and a wire tie clip to hold the wire and connector. The rivet is covered by the access panel so you don’t see it. 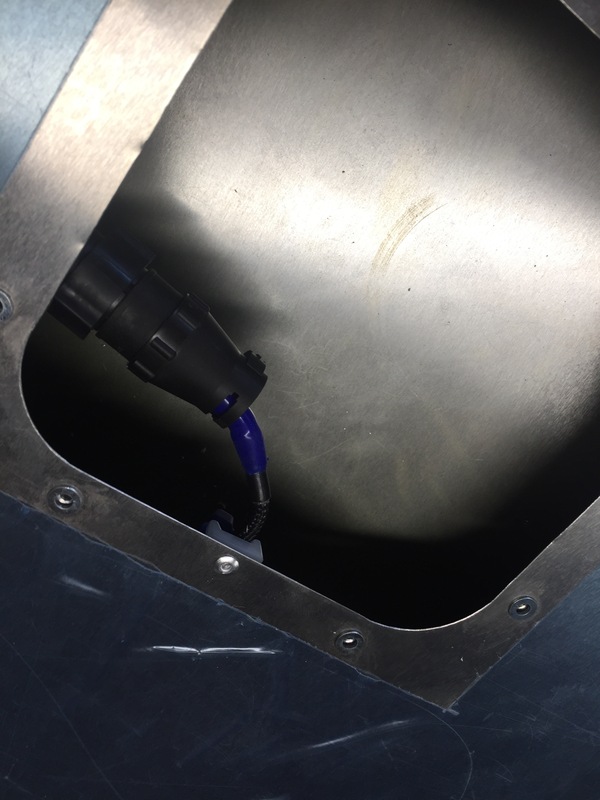 A photo of the installed trim tab. A shot of the finished HS and elevator. 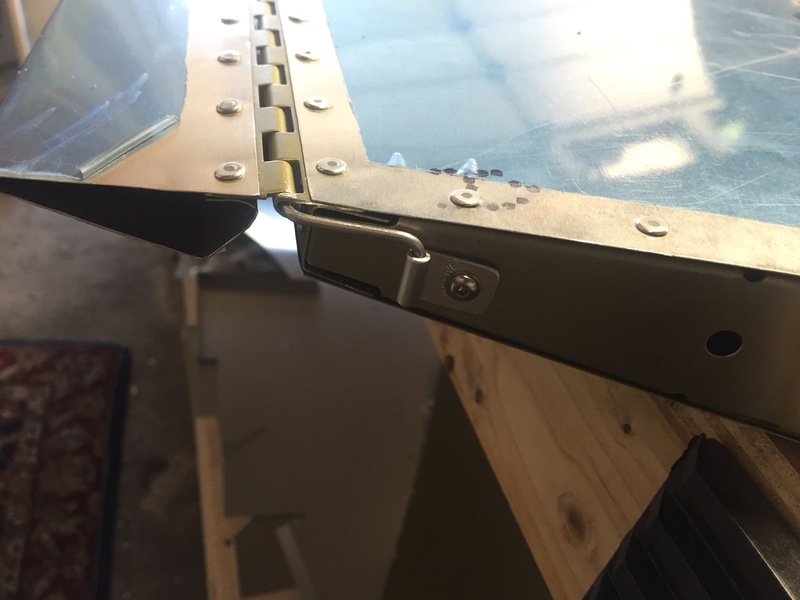 I wanted to secure the hinge pin for the trim tab, but the way my hinge was cut from the factory it wouldn’t allow me to do it the typical way other builds are securing it which is by drilling a small hole on either end of the hinge and then after inserting the pin putting safety wire through the holes. This keeps the pin in place and if you ever want to remove it you just cut the safety wire and push the pin out using another pin or something smaller diameter. I need to thank Peter V. and Pascal for all the support on this and the great ideas. What I decided to do was the RV style technique by using a longer pin and bending it in a way were you can install some kind of screw of clip to hold the end. I emailed TAF with this idea, but haven’t received a reply yet so I’m waiting to drill the hole for the rivnut. I’ll email them again just to be sure it’s OK to proceed. Today I bent the hinge pin and made a clip out of the end of another hinge. 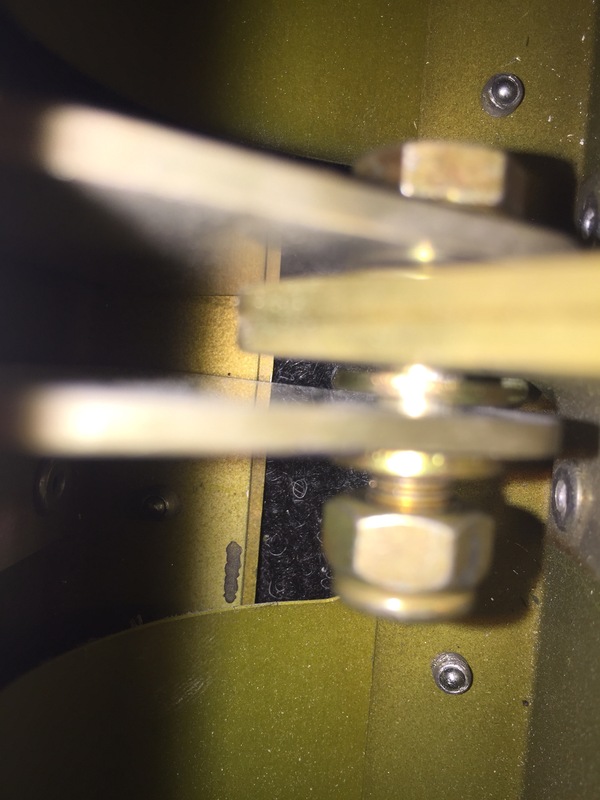 The last bit is to drill a 4.9mm hole for an M3 rivnut in the side of the elevator rib so that I can attach the clip to the side of the elevator with an M3 screw and some thread lock of course. I actually really like this idea because it makes the pin removal really easy, just unscrew the clip and pull out the pin. It is a tad bit ugly and I did try to put all this on the inside of the trim hinge but there just wasn’t enough room there and the bend in the hinge ping was a very tight 360º bend back on itself. 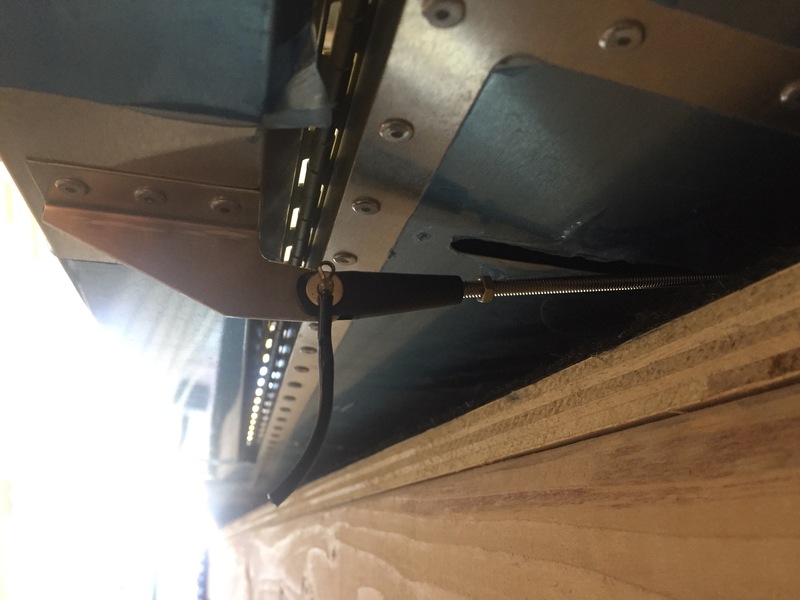 Here’s some photos of the almost finished hinge pin. Today I mounted the elevator trim servo in the elevator. I was going to use some washers and locking nuts on the inside to secure the servo to the elevator, but it proved to be way too difficult to get them onto the screws. So instead I just followed what the manual says to do and so I installed M3 rivets on the trim servo case. There was no issue with the rivnuts cracking the trim servo case like I had worried about. Once that was done mounting the servo in the elevator was was pretty trivial. rivnuts installed (with high strength thread lock), connector on and cotter pin installed on the clevis. Also put medium thread lock on the clevis bolt. Trim servo installed with 4 M3 screws and medium thread lock. I’m wondering if I need to secure the connector some how. I’m thinking it may bump around and dent the skin. I wish I could have use the smaller connectors, but the smaller ones only go up to 4 pins and this needs 5 pins. I also tried to install the new hinge pin. I was hoping I could put in a little longer pin and just put 90 degree bends on the ends. Well the hinge pin is pretty strong and there’s not much room on the left side of the trim tab to get large plyers in there so it’s pretty much impossible to make the bend. I also tried to flatten out the end using a hammer and some thin blocks of metal, but once again the hinge pin is just too strong to be able to do that. So it’s looking like I’ll either have to come up with some other creative way to secure the hinge pin or I’ll have to remove the hinge and put in a new one. To do this is a lot of work. 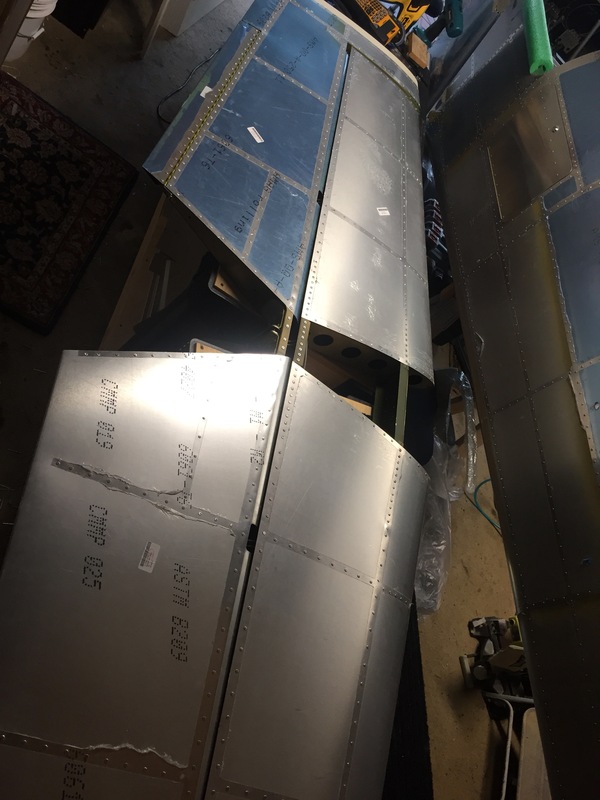 It means removing about 50 rivets, cutting the new hinge, drill new holes in the new hinge, priming the hinge and then installing it back which needs about 30 shortened rivets to be made. It’ll probably be 4-6 hours of work, but worth it to have the piece of mind that the pin isn’t going to fall out in flight. Though I guess it hasn’t happened yet to the other Slings that were built per the manual (with no means of securing the hinge pin). Well it’s been over a week since I worked on the Sling. It’s been a combination of being busy with other things and the lack to cash to put towards the plane. Too many things going on financially… wife needed a new car, paid off the Grumman Tiger, estimated taxes :-(, and working being a bit slow. In any case I’ve been trying to get to the low hanging fruit as far as cost is concerned to at least keep working on the build. The trim servo seemed like a good option. The Sling uses the Ray Allen T2-7A servo and the RC8-7 clevis so I ordered those from Aircraft Spruce. I also purchased a new trim tab hinge since I want to replace the hinge pin with a longer one that I can bend the ends on. I’m not able to drill a hole for a security wire like the other builders have done unless I want to unrivet and install a whole new hinge. 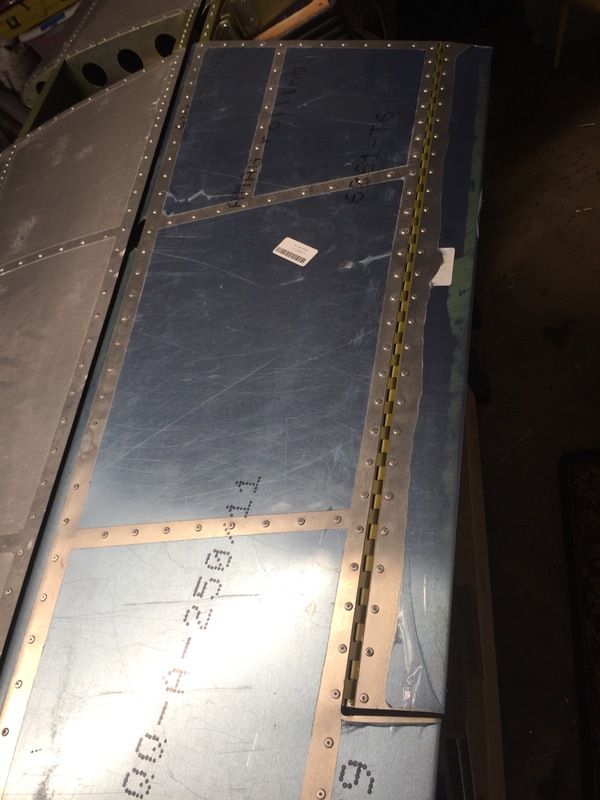 As a side note I know that you can just purchase the hinge pin for Aircraft Spruce, but it’s a 6ft piece they’re charging over $25 to ship it (for a $4 part). I found if I buy a 3ft hinge the shipping cost is minimal and the price difference in the part is only $1. So I’ll just remove the pin from the hinge and use that. Thanks to Pascal for the tip on the alternate approach to securing the hinge pin. Wiring the trim servo was a bit more time consuming then expected. The instructions that shipped with the servo only showed it being installed with the Ray Allen switch and LED position indicator (no of which I’m using) so it didn’t call out what each wire actually did. I referred to the VPX manual which did list out the what the wires were for, but just to double check I referred to the installation of MGL avionics and that didn’t seem to match up colorwise to what the VPX manual showed. The only way to sort it out was to do a test (I posted a short video of that). What it comes down to is that the White/Green is the position and then the White/Orange and White/Blue can technically be swapped around since all that it’s doing is putting power through a potentiometer so ground and supply can be swapped around and it doesn’t matter (unless you use the Ray Allen LED indicator). At full extension the position resistance is at around 20 ohms. And the mess of clip leads connecting to the switches. I didn’t happen to have a momentary DPDT switch so I used 2 DPDT latching switches, hence the larger mess of wires. Basically you need to connect one motor wire to 12V power and the other to Ground. You do this with a double pole switch (one side ground, one side power). This gets you to move the servo one way. If you want to go the other way you need another switch that flips the ground and power so the motor runs backwards. If you have a monetary DP switch the it will sit in a no connect state, when you press on the top of the switch then it comments the common (shared) terminals to the position 1 terminals and when you press on the bottom then it connects the common terminals to the position 2 terminus on the switch. I just had to use 2 separate switch to accomplish that. With the testing and verification of the wires down I wanted to pin it up and install it. The manual says to drill out the mounting hole sin the servo for M3 rivnuts. I’m thinking though the the M3 screws fit nice trough the skin and the mounting holes and then I can just use locking nuts rather then the rivnuts and thread lock. I’m worried that the rivnut is going to crack the plastic mount when I install it and I like using the locking nuts rather then rivnuts anyways. The problem is I only have 2 locking nuts and now M3 washers so I can’t install it today. But with the wiring done and the push rod installed on the servo it will go quick once I get them. You need to install the pushrod and clevis pin on the servo side before mounting the servo. With the servo set to approximately center I checked that the pushrod is screwed in enough to allow enough adjusting on the trim tab side. With that checked I think it’s safe to thread lock the retaining nut on the clevis (on the servo side). I put a short piece of wire sleeve and heat shrink on the wires. Also writers are labeled with heat shrink labels and the connector is on on. The last bit is just to wrap the area where the back shell strain relief with some silicon tape and screw on the back shell. Elevator with rivets all sanded, now just need to finish up the electrical work. Here’s the right side of the piano hinge. That small triangle bit of aluminum is where I’d have to put the hole for the safety wire. Although it doesn’t need to be a very large hole… a little more the 1/32″ I believe, I still don’t think there’s enough material there. And this is the left side. There’s a little more material on this side, but it’s in the side that moves so I can’t put it there either. Maybe I can do two holes on one of those larger areas and loop it through… Hmm that might work. Worked on the elevator today. The primer had dried for a few days on the right elevator skin so I was able to rivet it onto the skeleton. I used the technique from Pete C’s site (and Peter V,s) to make sure the elevator lined up with the HS. Seems like it lines up very lol now maybe very slightly off (1/32″ or less). 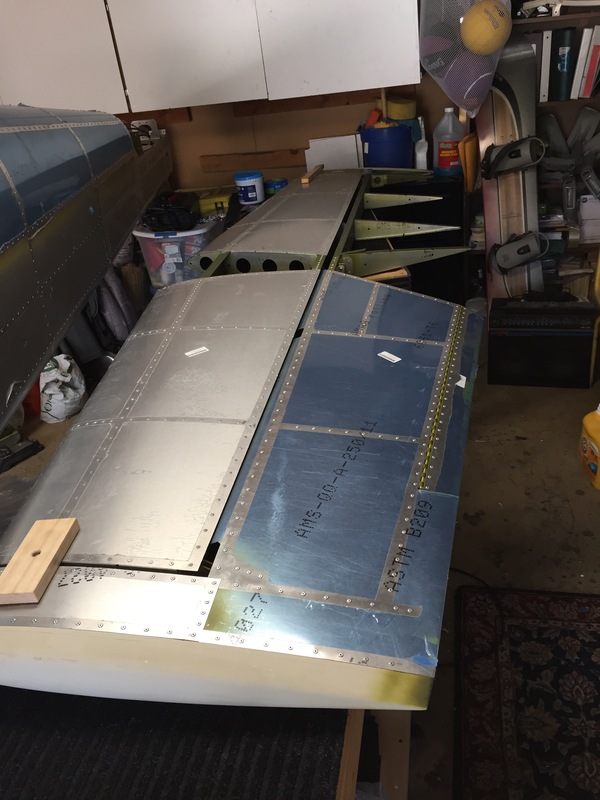 I also started to fill the rivets. I’ll be riding the Trim Servo (Ray Allen T2-7A) so I can finalize the HS and Elevators. 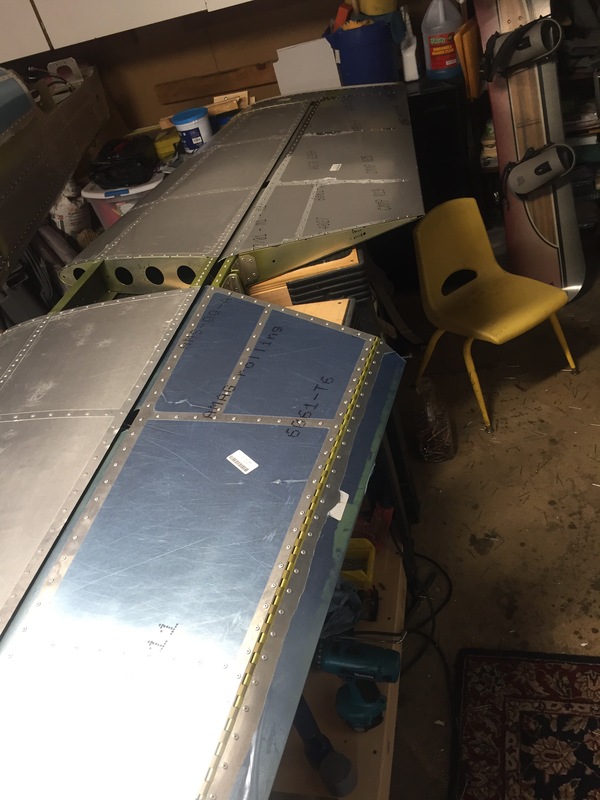 Clamped the elevator to the HS… all ready for the right skin to go on. All finished. The new skin lined up very well and the clamps helped with the HS alignment. Now just need the trim servo and the connector ends to finish these up… oh and also need to fill and sand the rivets.